When it comes to what insulation clothing is needed in the outdoors, you can find so much information that it is just amazing, and most of it is pretty good. What I have noticed, though, about the information available, the questions I get asked and the people I meet outdoors is that there is an implementation gap: many have no idea how to utilize their insulation layers for the best efficiency, comfort and weight. In order to add some guidance about the best way to use insulation and staying comfortable this coming winter, I wrote below about my method of staying comfortable when hiking and camping in colder weather. First, we need to make it clear that in this post, I will be referring to thermal insulation. Thermal is essentially anything heat or heat related, and the term is often used incorrectly; most things have thermal properties (conduction/insulation etc) while living things are thermally active – they generate heat. When something has thermal conduction it means that it can allow the transfer of energy in the form of heat from one body to another. Thermal insulation is aimed to reduce that thermal conduction – simple! The reason that we need insulation is to make sure that the energy our bodies work so hard to make by consuming food will not just be conducted to the air (two bodies: us and air) without our having benefited from it at all. If we don’t insulate ourselves from a cold environment, we will need to consume huge amounts of food, to be turned into energy, in order to sustain our bodily functions – though we probably wouldn’t be able to keep it up for long. What this means is that the result of not having enough insulation is more energy production – you can think of it in terms of house heating: if the house is not insulated well, heat escapes and you need to crank up the heat to keep it comfortable, burning more fuel. When we are outdoors this is even more important: we are usually active and our environment is harsher. We also don’t want to carry loads of heavy food to keep us going, but just the most efficient amount by avoiding too much energy loss. Insulation can be achieved by warming up a layer of a slow conductive substance that allows for the heat trapped inside the insulation to be released slower (and therefore allow us to enjoy the heat for longer). There is not really a practical way to insulate yourself completely, but there are more and less efficient methods; the most efficient of all is by using trapped air. Air is the best insulator we have managed to find so far, as the rate of lost energy on the outside takes a long time to reach the inside, allowing for very slow heat conduction. When in it comes to using trapped air for insulation there is a very simple rule: the more air that there is between the two bodies, the better the insulation is, so our goal is to trap and warm up as much air between our body and the cold air outside as we can. The main issue here is trapped air, i.e. air that will not just conduct and dissipate into other areas. Wicking – a capillary action of moving liquid through a narrow space using opposing forces (gravity v heat), or: the movement of your sweat from the inside of your shirt to the outside of your shirt and then facilitating it drying on the big external surface. The more wicking a garment is, the quicker it dries. Breathability – the movement of air and vapour through a narrow space (fabric, lung membrane etc), or: warm sweat turns into vapour in your shell and then moves through the fabric of your shell outside and dries out. Defining these two elusive and over-used words allows us to look at insulation at the function level, and not the popular or marketing terms. This is extremely vital in terms of choosing the right insulation for the right activity to avoid over heating, as this is one of the biggest enemies of long-term exposure when outdoors. When wearing an insulated fabric (any fabric that traps air) close to your body and being active in a colder environment, there will come the point when the body temperature rises and you will start to sweat. The sweat will almost certainly get absorbed into the closest fabric (I hope you are wearing some form of a base layer!) and then to the next closest, and so on. The mid-layer style insulation that is worn straight over a base layer (or sometimes as a base layer) will absorb sweat quickly, too. I’m guessing that it is not really necessary to get into why having wet clothing outdoors is bad, so I’ll just say that you want your clothing system as dry as possible, all the time. And this is where the wicking insulation comes into play: what you want is an air trapping fabric (always a single/dual layer fabric) that will absorb sweat quickly, move it to the outside surface and dry quickly. As we need this layer to dry quickly, the best option is to use synthetic fabrics as they are hydrophobic (repel water), unlike natural fabrics (cotton, wool) which are hydrophilic (absorb water). The most commonly known fabric in this group is the polar fleece, but wool fleece, hollow fiber fabrics and thick woolen garments all can be used in the same way. Wicking insulation garments are usually only made to trap air and generally provide no real wind protection. Wind is probably the main weakness of these garments, as it will just “swoop” away all the hot air trapped in the fabric, and so they need a protective layer over them (hence why it is a mid-layer). Some of the newer fabrics might offer some wind protection (like the Polartec hardface) but usually that tends to be very low in wind protection or they become shells. I know I mentioned breathability above, but in reality most insulations are not breathable. They tend to be very much meant for static situations (camp, belaying, breaks etc), as those are the times when we need the extra insulation. Non-breathable insulation is made by trapping a high loft material (i.e: down, microfiber, wool etc) in a pocket, usually made using thin, high tenacity, synthetic fabrics. “High loft” insulations usually are constructed in a way that makes breathability practically impossible, or are so thick that breathability is neglected. The up side of non-breathable insulation is that it can use very high loft materials and so offer a great level of insulation. We can immediately split this category into 3: down items, synthetic insulation and others (wool, alpaca, yak etc). As these garments are not breathable, they are obviously pretty useless while being active – you will overheat quickly and won’t be able to “dump” that heat. The are also not practical as mid-layers, as the fabrics containing the insulation are most likely windproof and maybe even waterproof, so having a shell over it (unless it is a rain shell when static) is a redundancy. Last, layering these garments under a shell means that the insulation will collapse, creating a complete loss of the trapped heat. Thickness – probably the single most important factor. The thicker the garment, the warmer it will be; so if you are usually cold or will be in a colder environment, it is a thicker garment you are after. Weight to warmth ratio – the “bang for the buck” for an outdoors enthusiast. Obviously we want to carry the lightest option we can find (and afford) and get the most warmth out of it. This is where fill rate comes in; I will not explain it here, just look at the further reading in this section. Limitation – synthetic fibres can only be so thick without collapsing and will never be as thick as down is. Down is, however, extremely sensitive to humidity and condensation, making it a risky item in wetter environments. You may notice that I didn’t factor in cost; this is due to the fact that cost will be determined by the above factors: a very light (under 500 gr), thick, down jacket with 850+ fill power will be very expensive, for obvious reasons, unlike a thinner, lower fill power version. My recommendation is to always look at these garments as resting time items only. Down is the “original” insulation material and it offers the best warmth to weight ratio when compared to any other air trapping insulation. Down can also be clustered to create a very thick garment, which means that the warmest items to be found are usually made from down. On the other hand, down’s sensitivity to humidity makes it something that should only be used under protected conditions: in very dry and cold conditions (desert/icy snow/tundras etc) or in base camp where a shelter is available. Lately there has been a rise of waterproof down – a specially treated down that is less sensitive to humidity and getting wet. This, theoretically, solves all the downsides of down, but it does come with a price – a literal one. Waterproof down garments are very expensive, but with the potential of a longer life, they should return the investment. Synthetic insulation is essentially the human attempt to mimic nature’s down material with polyester-based insulations. There are various ways that this can be constructed, and every company claims to make a better version of it. In reality, all the synthetic insulations are “fluffed” polyester mircofibers aimed at trapping as much air as possible. The problem with synthetic insulation is that it struggles to keep its structural integrity in high volume, so it is usually used as a thinner insulation compared with down. Of course, synthetic insulations are not sensitive to humidity and many times will continue working even if wet in retaining some heat and offering some protection. Due to this property, synthetic insulations are many times seen as “belay jackets” (or trousers) that can be put over any layer, even if wet, when stopping for a short time. That means that the best way to use a synthetic insulation garment is as a quick overlayer when stopping your activity for a short time (you will need to find how long you can last on your own, according to your level of tolerance); i.e: belaying a partner, a short stop in a hike, ski etc. There are many names in the industry for these insulations, but the key brands are: Primaloft (proprietary), Heatseeker (North Face), Coreloft (Arc’teryx), Microtemp (Columbia), Thinsulate etc. The insulations in this category are actually all very, very old but are enjoying a resurgence in the outdoors market: yak, sheep, llama (and other) wool. The idea is to trap more “fluffed” versions of the wool and protect it from the elements using protective synthetic fabrics. These garments tend to be thinner compared to down (and even synthetic insulation), and at times can even be used as mid-layers. The obvious positive aspect of using natural insulation is clear – it has all the positive properties we desire: anti-microbial, retain heat when wet, sustainable etc. The big drawback with these garments is that many times they are not thick enough to use as static garments, making them less useful as a non-breathable insulation. Manufacturers have been trying to solve the problem of needing warmer mid-layers when being active in very cold conditions, when the danger of sweat build up is not only real but life threatening. The idea is to use insulation that can be breathable, to allow some level of sweat evaporation. In this category we find names such as Polartec Alpha. Besides using specific insulations, some brands will use a mix of fabrics and insulations to create a warmer yet slightly wicking garment. Most common is a mix of synthetic insulation on the core/arms and fleece under arms and side panels (and sometimes the back as well). It is easy to see how a combination of fabrics will result in enhanced wicking ability while keeping other areas warmer. The problem with garments like this is that they usually compromise somewhere, mainly on the breathability front. In the cold conditions where this level of insulations is needed, the dangers of being wet are extreme, so I would look into layering using the wicking insulations rather using the breathable insulations. At the end of the day, our goal is to stay comfortable outdoors. All the terms above need to translate to real, usable garments that can be effectively utilized outdoors. Below is the list of garments I believe any hiker/walker/backpacker/climber should have in his/her arsenal to be able to be active through most of the year. I’m assuming you are using the right baselayers, but that is a whole different topic. A solid belay jacket – a synthetic jacket that can be used over your shell for any kind of break. Find the fit or brand that works for you and pick the right weight of insulation: for most men 60g insulation is enough and 100g for women. Go for heavier insulation for colder conditions (120g+). 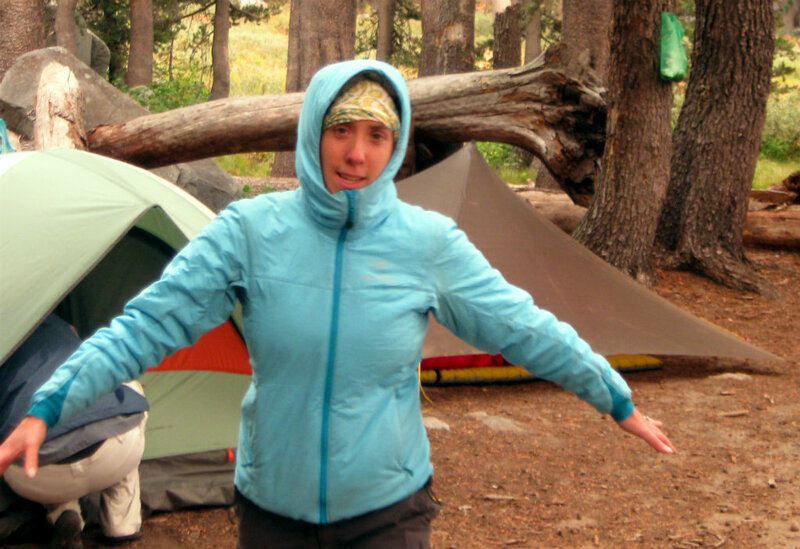 This jacket should be in your pack on any outing in cold and potentially wet conditions. Thin down jacket – not really obvious for most, but the “micro” down jackets that have become so popular in since 2010 can be layered under the belay jacket for a low weight solution for extra warmth. When camping, this can also become a pillow. They tend to be very packable and light; aim for at least 700+ fill for this. 100g/stretch fleece jacket or pullover – this is your most basic mid-layer when the conditions are cold to put on under your jacket. Focus on polar fleece only (to dry quickly and which come at a good price) and it is worth investing in a stretchy fleece for a closer fit under a shell. Thick down jacket – a warm down jacket that can be used while your legs are in the sleeping bag will increase comfort dramatically. Getting a good jacket is not simple and it is a personal preference, so I recommend going to stores to try them on and have a guess about your comfort level and warmth needs. For example, I have a high tolerance but I hate being cold (once I get to that point), while my wife has a low cold tolerance but doesn’t seem to mind a bit of chill. I recommend at least 600+ fill for anything that will be packable, and keep it thick with a nice warm hood. Waterproof down will increase the life of the jacket and will make it less fragile. Fleece tights – these are a real luxury but they will also boost your sleeping bag rating and make the night much warmer. The best is to find a stretch fleece trouser that can be almost like tights. Thin fleece top if you are working hard or tend to be warm. The more technical winter base layers will do the trick well, or something like the Polartec Power Dry or Power Grid which are amazingly fast to dry. Hybrid fleece/synthetic jacket for cold or mixed conditions. Especially useful for cold climbs when the arms are warm and the core cold, using the hybrid style jacket is useful for heat regulation. Fleece gilet is a great way to boost warmth in a simpler and more modular way. I do own a fleece gilet yet have found that I rarely use it, and I have never taken it on an outdoors adventure. I tend to find that my arms are the coldest, but for many people I have walked, climbed and backpacked with, the fleece gilet was a must-have item. Synthetic insulated trousers – this is really a specialty garment, but you can think of it as a belay jacket for your legs. Really used in very cold conditions only or if less static. If you are choosing to use one, search for at least 60g insulation and a full side zip for easy on-off over ski pants or waterproof trousers. I hate being cold, I really do, despite all the odd things I choose to do, even in the worst of weather conditions. I also can’t afford to buy 10 different jackets to always be optimally comfortable when outdoors. I think the list above of the core insulation garments is extremely useful and worth investing both the time and the money to buy the right items. It is also important to understand that unless you actually get your insulation and take it outdoors, you will never know if it performs well for your needs, so get something and go outdoors. A good way to maximize your insulation is to be modular and layer smartly, while avoiding over heating and sweat. I hope this helped you better find and use the right insulation for your coming adventures.